This past weekend was a great one. After some crazy weeks and some even more crazy weeks to come it was nice to escape the city to hang out with one of my closest girlfriends Gail. We both took our Fridays off from work in order to get a head start on our time together. Seeing how we live in different cities and an extra hour here or there are precious hang out minutes to us. Friday started off with checking in early to our hotel, the glorious Delta Montreal, setting our stuff down and then heading out for our first round of shopping. After several hours of walking around, a Starbucks break and more walking around, we headed back to the hotel to rest our feet and get ready for what was sure to be a delicious meal. 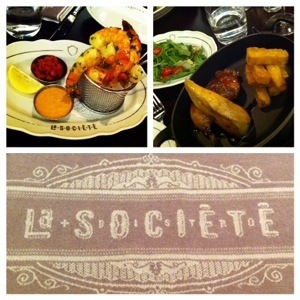 Friday evening we headed over to La Société a Bistro style restaurant with some super tasty dishes. We split a magnificent shrimp cocktail and then I had some delicious maple bourbon chicken with crispy potatoes and s super fresh salad for my main. I skipped desert because I was stuffed but also because of my nut allergy, desert isn’t really something I can get as a rule when eating out. After supper we were initially going to hit up a comedy club but after a morning of traveling, an afternoon of shopping and walking around, we both just wanted to relax a little and catch up some more. So we headed back to the hotel room to chat and relax. I was up bright and early Saturday morning, I seem to be missing the gene to sleep in. I knew this would happen so I was sure to bring my gym clothing so I had something to do while Gail was sleeping until a reasonable hour. After the half marathon I had taken some time off of rigorous exercise and had been sticking to yoga for the past week so it was definitely nice to get in some gym time. Normally I don’t have very high hopes for hotel gyms because well they really don’t seem to be a priority in most hotels. 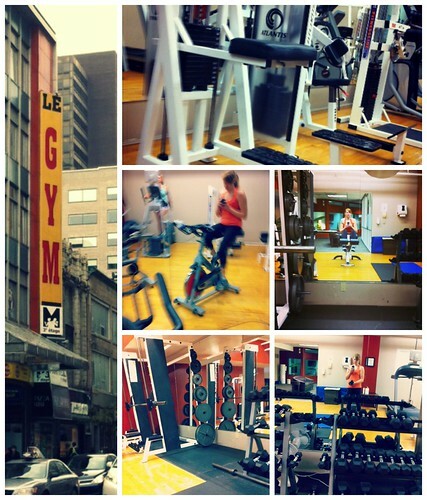 However, this gym was fantastic! I was surprised by the range of weights, machines, cardio equipment and the stretching area that was available, they even had a squash court and a pool! Initially I had planned on doing a body weight circuit but when I was surprised by all of the equipment I couldn’t resist throwing in some weight training. After a great workout I headed back upstairs in the hopes that my friend was starting to rise. 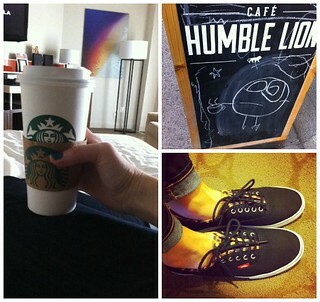 I then quickly ran over to Starbucks to grab us some tea and quick breakfasts before we got our day started. Although we had spent much of our Friday shopping the sun was out Saturday and there were just so many excuses to hit the streets again to see if we could find anything we loved. We wandered up and down St. Catherines popping in and out of stores and checking out what they had. Unlike Ottawa, Montreal has a Vans store so we were sure to check them out and get me a new pair of kicks. 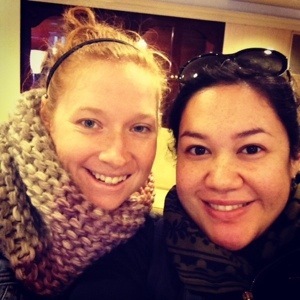 With another day of shopping under our belts it was time to head back to the hotel to start getting ready for dinner. Oh my gosh dinner! 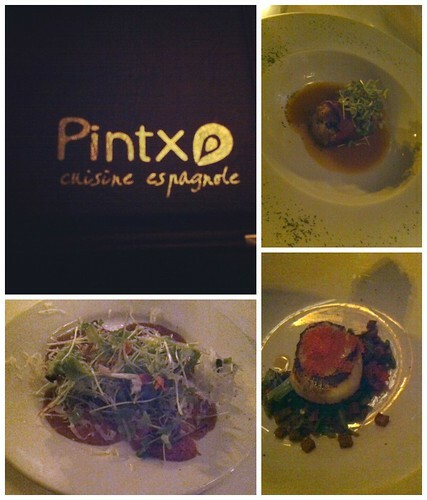 Dinner was incredible, Gail picked a place called Pintxo which serves small Spanish style tapas. Gail knows me pretty well and knows that I love tiny plates of things, because you get to taste more that way, and I am not a fan of sharing my food. Dinner was amazing, the restaurant was extremely cautious and attentive to my nut allergy (which is always a plus), the waitress totally knew her stuff and recommended the tastiest glass of wine and every plate I was served was more delicious than the one before it. The resturant had an option where you could get 4 small pintxo and a main or you could get the regular sided pintxo and however many you wanted of them (they recommend 4 to 5 to make a meal). Everything looked so tasty so I went with 4 pintxo so I could taste a bit of everything. The lighting wasn’t the greatest and I gave up on taking photos when my last dish was served (it was a goat cheese ravioli in a duck stew, can you say amazing!). If any of you are ever in Montreal I strongly recommend finding this place and tasting it out, it was by far one of my favorite treat meals in the past 5 months. I was saddened when the plates stopped coming, but also happy because I was pretty stuffed. Luckily Sunday both Gail and I had later travel plans which meant some more time to hang out and enjoy the city. We both took our time getting moving and then headed out for a late breakfast at a nearby dinner. 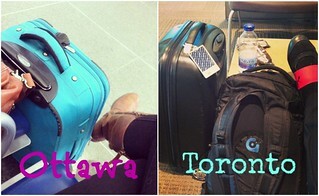 Once it was time to head out we packed up and both headed to our respective modes of transport. As awesome and fun as the weekend was I was excited to get back home to my husband and kittens and to do some Sunday afternoon lounging. The rest of my weekend was filled with movies, kitten cuddles and some relaxation in preparation for the coming week. I hope everyone had as wonderful of a weekend as I did and you were all able to stay warm in this increasingly cold weather. This entry was posted in Food, General and tagged deliciois, delta, food, friends, gym, shopping, weekend, workout by healingginger. Bookmark the permalink.